Longer than I would like between posts this time. 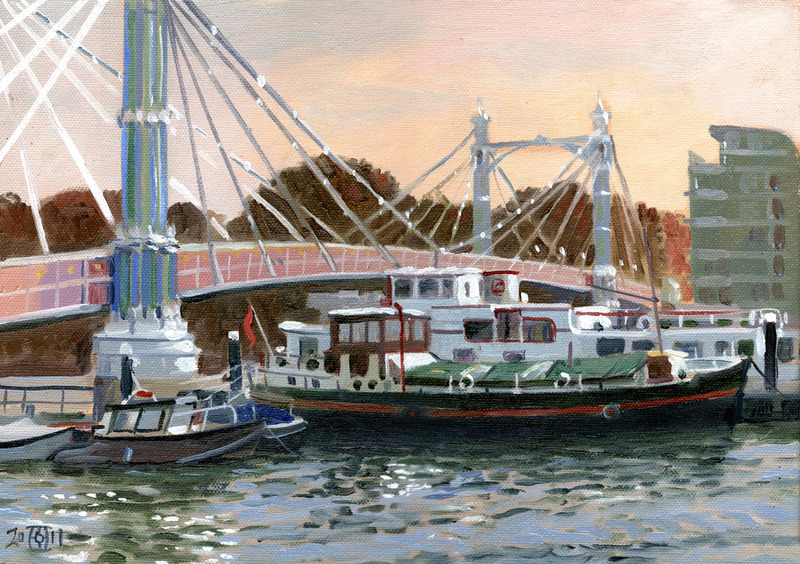 Getting all my commercial responsibilities finished and preparing to go off for Christmas was made all the harder by a bout of the flu that put me on my back for 7 days… Before I was struck down I went off painting by the Thames on a beautiful day with the Brass Monkeys. River compositions are always tricky, there is a built in one sidedness caused by painting from the river bank. 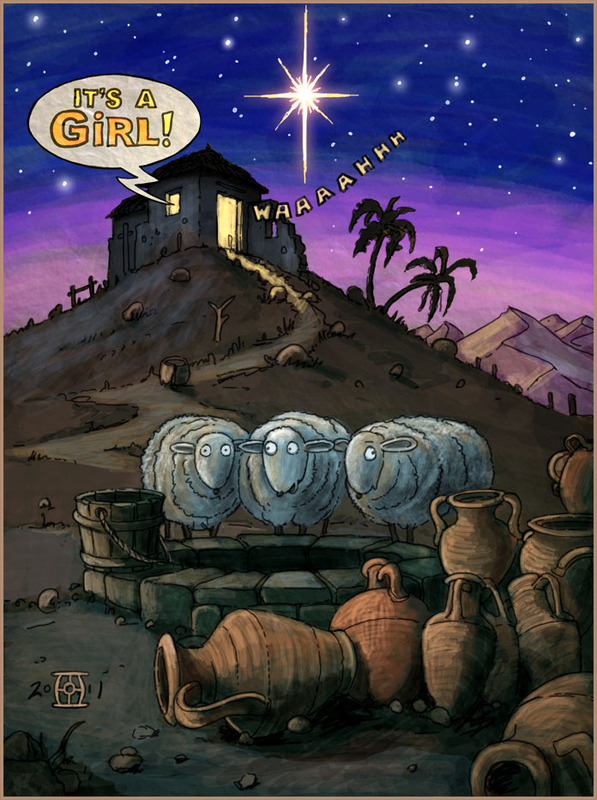 I also had to produce my yearly Christmas card which I usually do in Photoshop. Traditional media artists often react with a shudder to computer based painting, but over the years it has become second nature to me. I did my first digital illustration work in 1990 with Fractal Designs Painter program so that’s twenty odd years ago. I soon realised it was just another media the same as any other, but very suited to illustration as the inevitable amendments required by clients are easily done. I still recall having to repaint jobs several times from scratch in order to incorporate requested changes… often for no extra fee. 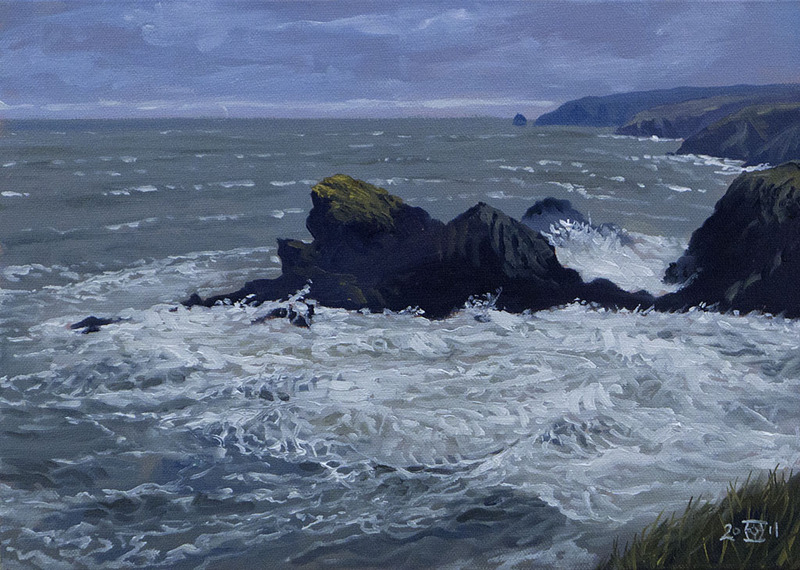 I am typing this while in Newport Pembrokeshire where I have been treated to some gorgeous light and dramatic seas. 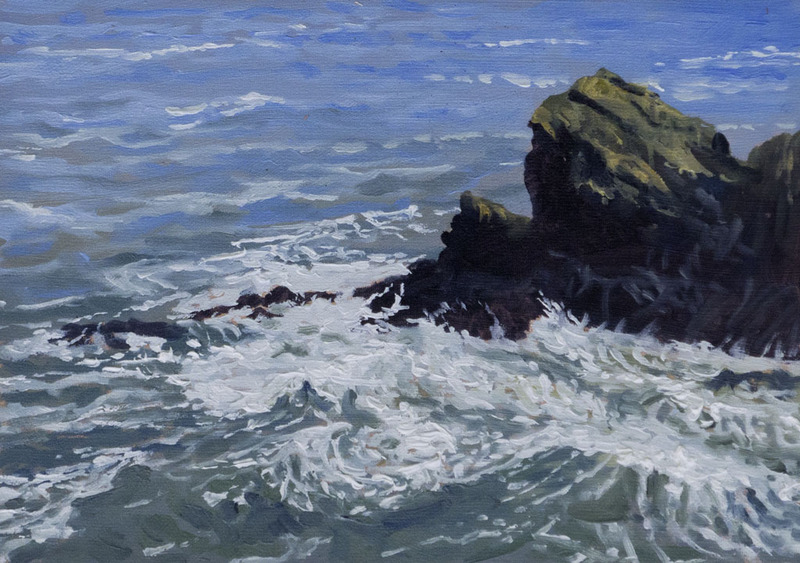 I have been wanting to paint some stormy seas for years, but have been cursed on every coastal visit for about 7 years with lovely sunshine and smooth seas! This time however I have struck lucky, a major storm had hit a day or two before my arrival and the sea was at it’s best. An added bonus has been that the light has been fantastic with everything from bright sunshine to looming clouds but no real rain. That’s all the good news… the downside was that the winds were still gale force and the wildly gusting wind wickedly cold. All in all very frustrating, wonderful subjects every way I looked, but impossible to paint them. I did set up on the coast path cunningly weaving the legs of my tripod through a handy wire fence. Though hard to stand upright it seemed possible so I squeezed a line of white out on to my palette, bent down palette in one hand to add some blue only to find when I stood up that the white had gone… blown clean off the palette! I was forced to only paint what I could see from sheltered spots… still I have some great reference photos which will make some dramatic studio pictures once home. Here’s Seasonal greetings to any readers… my site stats say there are, but sometimes blogging seems like talking to the void! Still I have found keeping a journal in this way has inspired me to do a fair bit more painting than I might otherwise have done and trying to put my thoughts down has required me to think them through properly, which has done me no harm at all. 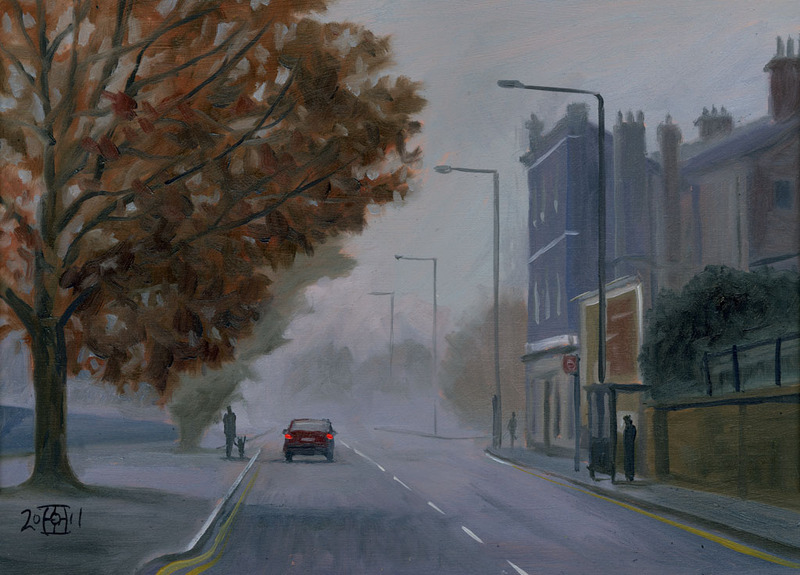 Fog nowadays is quite rare in London, so when I got up and found everything shrouded I decided to have a stab at painting it. This is literally outside my door so it was quick to set up. I decided everything had to based around making the rear lights of the car sing out. To this end I mixed most of the tones for this before painting much. I put a blob of the red on the palette and set the base tone of the murk against it so as to be sure it would contrast enough. The foggy stuff had to be a fair bit darker that I would have expected. People sometimes talk about getting a tone accurate, but in reality that is a wild goose chase. What you actually are doing is getting your range of tones in an arrangement that is “relatively” accurate. So for example I might start mixing by finding the lightest and darkest tone I am going to have in my picture. Once these extremes are fixed then a middle tone can be identified and so forth. Getting a tone accurate is impossible because real values are unavailable in paint. This brings with it all sorts of creative possibilities. 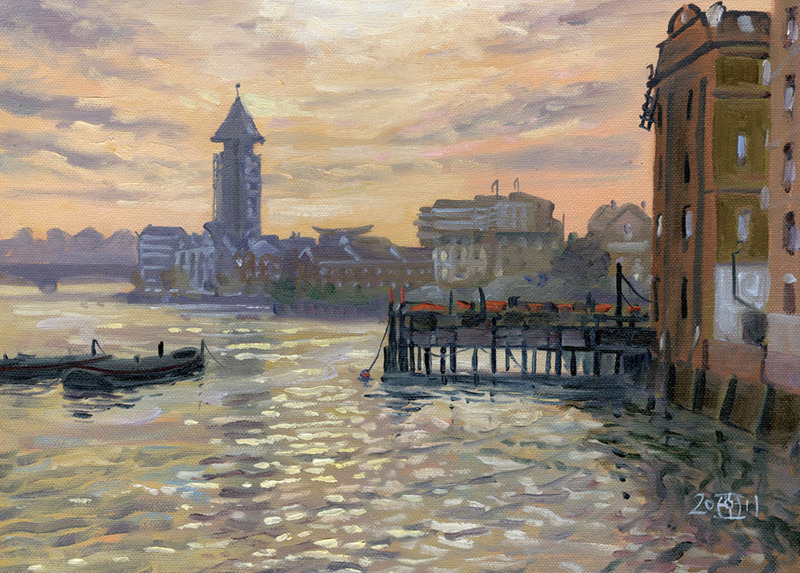 I could have painted this picture with a narrower range of light to dark and providing my mid tone was placed in the centre of my new lightest and darkest and the other tones in their relative positions in relation to each the painting would still read perfectly well. Indeed I think I used too wider range here and limiting it more might have been better. 14in by 10 in. 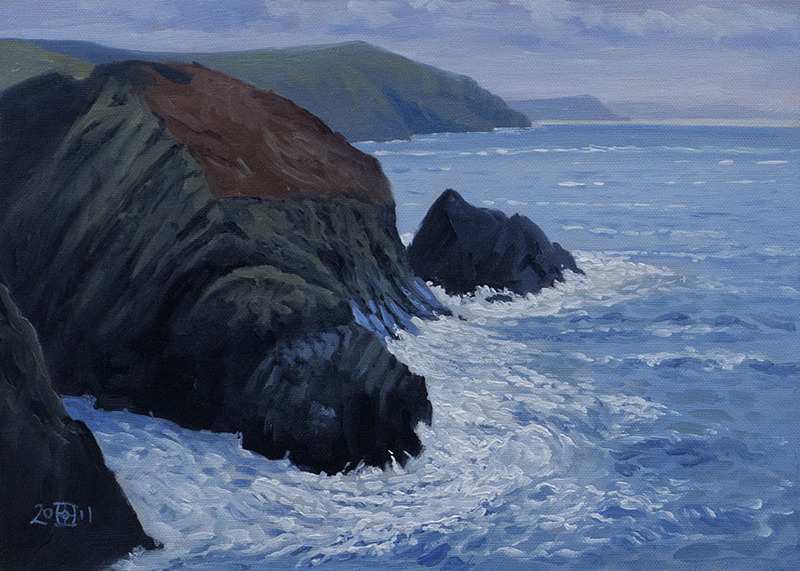 This is the first painting done from my sheltered spot down the cliff. A little bit precarious, I had to do it sitting on the ground with my pochade on my knees. I think I got a bit more detailed than I usually do because I couldn’t do any stepping back. But no matter the surging water was great fun to paint. Once this was done, I was at a bit of a loss so I did another smaller one from the same spot. 14in by 10in. I decided to do a smaller study, this is 10in by 7in. I did the surf by just sitting and watching the patterns for a while and just dotting in shapes I liked when they occurred. Once the basic flow is there then the internal detail doesn’t really matter. I deliberately mixed a little Naples Yellow with my Titanium White on these so that I was sure of having one step of extra brightness for a the very last touches. It is very tempting to go in with a full white but it is really best I find to keep it in reserve for the very last bits of what is sometimes called “Jewellery”. Last one for now 14in by 10in. Not quite so sheltered here… so I struggled a bit trying to hang on to everything. 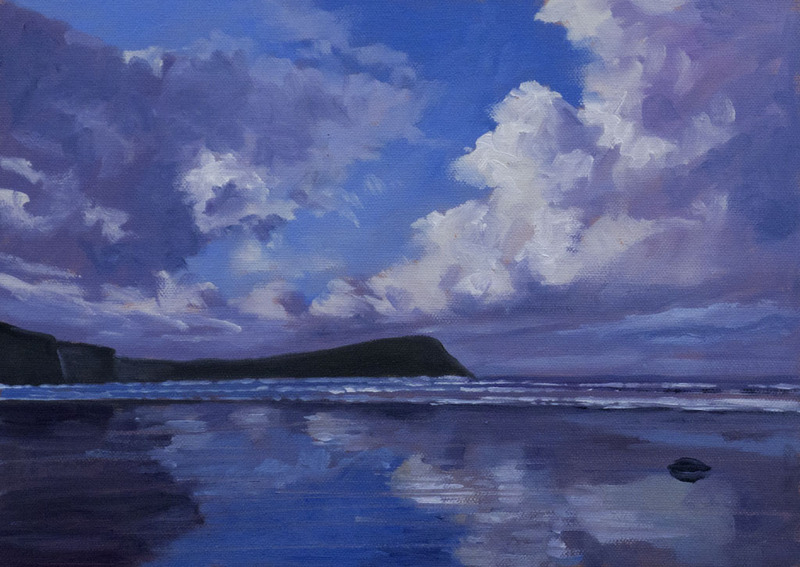 The Pembrokeshire coast is fantastic for painting so I have no complaints. There are watercolours to come but they will have to wait until I am home and can scan them. I am off to Ireland next so hopefully more paintings will result… but what with Christmas and the company of old friends, and plenty of food and drink that is not certain! The weather forecast is for rain followed by more rain so it’s just as well I have a big tube of Paynes Grey with me.